Do not let the rain ruin your camping mood! 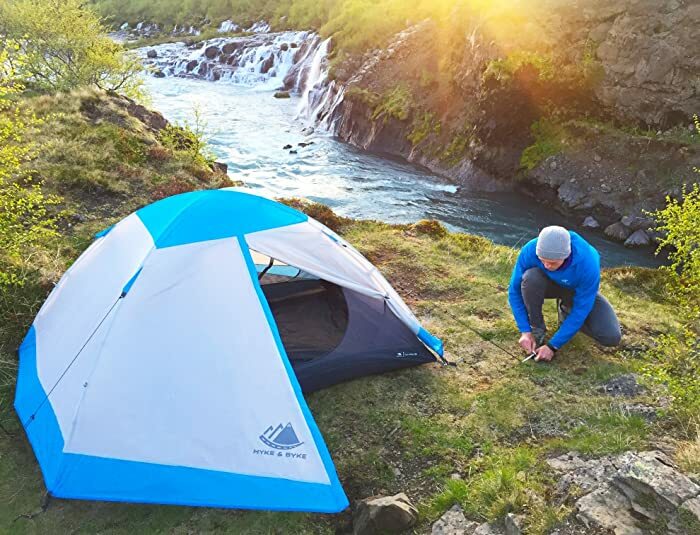 If you love the outdoors, you should invest in the best waterproof tent, including those that will be mentioned in this quick guide. 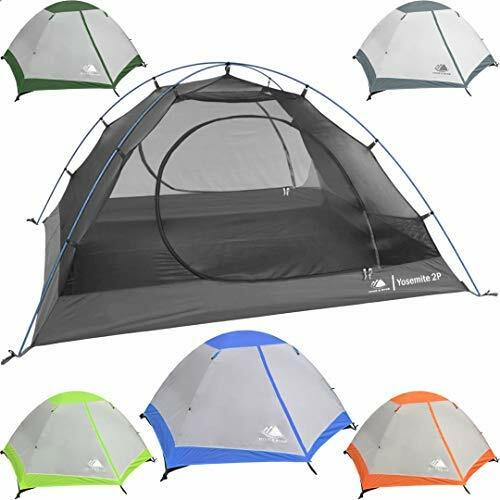 It is not enough that you have a lightweight and durable tent. What if it rains? If the tent is not waterproof, you will most likely end up being wet and uncomfortable in your sleep. Good thing, with the tents that we will recommend in this post, you won’t have to worry even when it rains. What Makes a Tent Waterproof? Undecided which one to buy? Below are five of the best products you might want to consider, as well as the features that you can expect in each of them. If you are camping solo and you are looking for the best tent to bring, this one should be on the top of the list. It has a freestanding two-pole design that is made of aluminum. No assembly will be required, making it the perfect option for those who are impatient in assembling a tent. While it is made just for one person, which can be cramped, it is designed in such a way that you will have several storage spaces. Aside from the storage pockets, there is also a small gear loft. The main material that is used in the tent is tough polyester, which is known for its excellent ability to resist water. It is also constructed to resist UV damage, which will help prolong the lifespan of the tent. Aside from the fabric, waterproofing is also ensured in the construction of the floor. There are no corners and there is a factory seal to keep the water out. It is also coated to keep it dry. Even the zippers are durable. They are extra-large. To add, they open and close smoothly. This is unlike other tents wherein the zipper often encounters a problem. This polyester tent can be a bit cramped, but it comes with a gear loft and storage pockets. It is also user-friendly since there is no assembly required in setting it up. 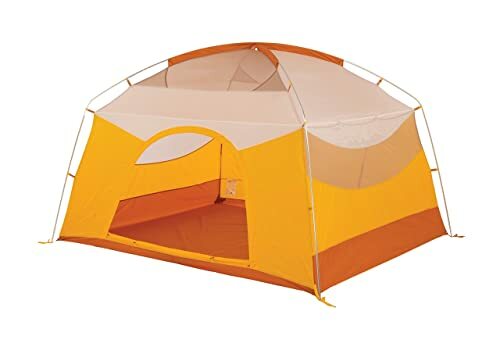 Designed for one to two persons, this is another waterproof tent that is worth considering, although there are some people who complain about the durability of the rainfly. It has bathtub floor and taped seams to help keep the water out. 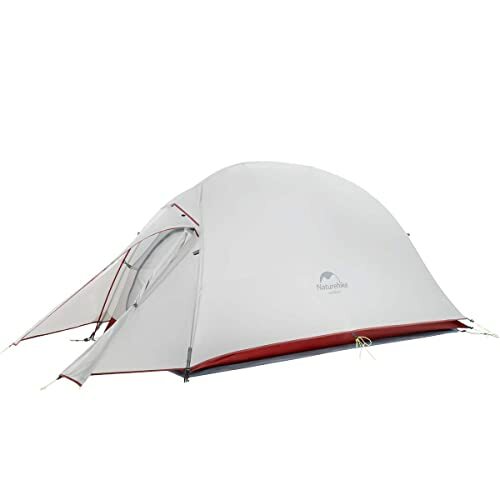 While the tent is lightweight, the durability is not compromised in any way. From the stakes to the guy lines, you can expect it to be long-lasting. With the clip-pole attachment, setting it up will not be a problem. Your tent can be ready in an instant! You also do not have to worry about your comfort. The tent is roomy as long as the capacity is followed. Even better, there is a detachable mesh ceiling, which will help improve ventilation. As a bonus, the tent already comes with a free footprint. This will come in handy not only for making it more waterproof, but it can also extend the lifespan of the tent and will make you sleep more comfortably. Lastly, the manufacturer is offering a lifetime warranty, which should be enough to provide you with peace of mind. This lightweight and compact tent will give you a roomy shelter when camping. The tent also comes with a lifetime warranty for your highest level of satisfaction. The innovative design of this tent is one thing that has captivated the attention of many people. 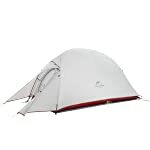 It has an aluminum hub pole, which will maximize the volume inside the tent. This makes it spacious, providing you with enough room to move around. It is a three-season tent that is built to withstand varying weather conditions, so there is no need to worry that your camping trip will be ruined once it rains. The rainfly is seam-sealed, as well as the floor. There is also a free footprint that will help in keeping the water out of the tent. This can also prove to be great if you are after breathability and comfort. When it is hot, you will still feel cool inside the tent. This is because of the included vents, which will allow air to circulate inside the tent. The double-door design is also a plus, making it easy to enter and exit. There is dry gear storage in one of the doors. This tent features aluminum hub pole construction with dual doors and storage for your camping gears. The poles, however, are not the lightest that you can find on the market. The construction of this tent is one of the reasons why this can prove to be another exceptional choice that should be on your radar. The main material that is used is 20-denier ripstop nylon, which is long-lasting and has the excellent ability to repel water. It is also UV-resistant, which will protect the surface of the fabric from eventual damage. Many of the users of this tent also expressed words of praises when it comes to how roomy the interior is. It is rated for 3-person use. If you have a lot of camping gears, however, it will be best to limit its use to only two people to have more space to move around. Setting up the tent may take about five minutes on average. This is not as good as those with pre-attached poles that do not require any assembly. Lastly, it is worth noting that this is a 4-person tent. Essentially, what this means is that you can use it throughout the day. Regardless if it is sunny or raining, or even when it is snowing, the tent will provide a reliable shelter when you are outdoors. This tent can be your reliable camping companion regardless of the weather. It is made of rip-stop nylon and has excellent waterproofing to guarantee your comfort. If you are camping as a small group, this tent will be a good choice. It has steep walls, which will provide a more spacious living space unlike those with a traditional dome design. 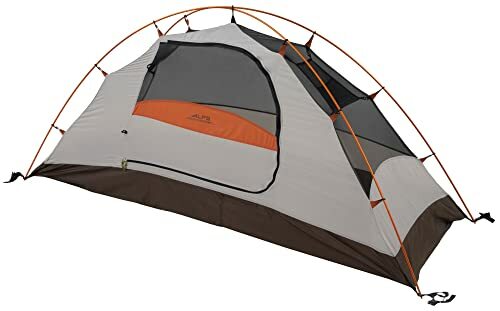 The tent is also tall enough to ensure the comfort even of the tall users. Setting up the tent will require minimal effort on your end. While it does not automatically pop-out, it comes with color coded webbing and buckles, making it easy to determine which ones will be connected. As it is a waterproof tent, the materials used are incredible. Perhaps, this is the reason why it is the most expensive from the five tents that are mentioned in this guide. It is made using polyester and polyester mesh. It is also seam-taped for added protection from the rain. This roomy tent is designed with step walls to provide more living space. It can color coded poles for ease of assembly. Waterproof Membrane: Waterproof tents can be made of different materials, such as nylon and polyester. It is essential that it is coated. This will prevent the water droplets from getting inside. Taped Seams: The seams are often the culprits on why water finds its way inside the tent. A small damage will make water penetrate. So, for the tent to be waterproof, the seam should be taped or sealed. Durable Zipper: Water can also enter in the tent through the zippers. With this, the zippers should be durable enough and should have no spaces between them when closed. Footprint: Some of the tents that have been mentioned above come with a free footprint. Basically, it serves as the ground cover, providing an additional barrier against water while also prolonging the lifespan of the tent. Choose the Right Location: You should not just set up your tent anywhere in the campsite. Find a location away from a lake or river since water can escalate quickly. It will also be good to choose a shaded area to minimize the effect of rain. Pack the Right Clothes: Make sure that you also have clothes that won’t easily get dry or those made of fabrics that are quick-drying. Place a Tarp on the Top: If you want additional protection from the rain, you can also place a tarp at the top, which will provide a secondary roof. Ventilate your Tent: From time to time, open the tent in areas where water won’t get in. this will prevent water build-up as a result of moisture. Waterproof the Tent: Through the years, especially in tents with inferior quality, the waterproof coating can fade. A waterproof spray should be applied, as well as a seam sealer. Size: Consider the number of people who will be using the tent, making sure that there will be enough space to move and sleep comfortably. Do not forget to take into account the space for your camping gear as well. Weight: No one wants to be burdened by the weight of the tent as this can sacrifice portability. See to it that it is lightweight, especially the poles. Comfort: It is not enough that you stay dry when it is raining. What about when it is sunny? Look for features that can ensure your highest level of comfort. For instance, there should be mesh for ventilation. Ease of Use: For the tent to be easy to use, the assembly must be completed in a short time. The best ones are those that automatically pop out when unfolded. If not, there should be color-coded poles that will make the assembly a breeze. Durability: You have to take into account the quality of the materials that are used. They should be thick enough to withstand wear. The zippers should also be durable. Taped seams are also great to have. Do not waste your money by choosing a tent that won’t be able to withstand the tough outdoor conditions. Warranty: This is one thing that will provide you with peace of mind. If the manufacturer is confident about the quality of the tent, they won’t hesitate to offer extensive warranty coverage. Some even have a lifetime warranty. The tents that we have mentioned above are made from waterproof fabrics that are also long-lasting. You can sleep in peace knowing that it can repel water and that you won’t get wet! It is an essential investment for all outdoor enthusiasts.